Joaquín Andújar (Spanish: [xoaˈkin anˈduxaɾ]; December 21, 1952 – September 8, 2015) was a Dominican professional baseball pitcher who played in Major League Baseball (MLB) for the Houston Astros, St. Louis Cardinals and Oakland Athletics from 1976 through 1988. Andújar was a four-time MLB All-Star and a Gold Glove Award winner. Andújar signed with the Cincinnati Reds in 1969, one month shy of his seventeenth birthday. He posted a 33–41 record with a 4.33 earned run average over six seasons in the Reds' farm system. 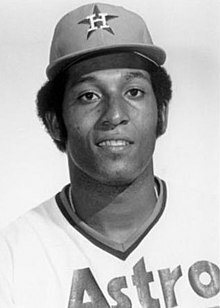 Following the 1975 season, he was dealt to the Houston Astros for two players to be named later (on December 12, 1975, the Reds received reliever Luis Sanchez and third baseman and catcher Carlos Alfonso). Andújar made his major league debut in the 1976 season opener against his former franchise. After two relief appearances against the Reds, he was moved into the starting rotation. On July 11 and July 17, Andújar pitched consecutive 1–0 shutouts against the Montreal Expos and New York Mets. For the season, he went 9–10 with a 3.60 ERA. Andújar was 10–5 with a 3.47 ERA at the 1977 All-Star break to be named the Astros' sole representative in the All-Star game. However, he injured himself in his final start before the game and could not play. He did not return to his team until September, and finished the season 11–8 with a 3.69 ERA. Andújar began seeing more work out of the bullpen in 1978 and earned his first career save on August 25 against the Pittsburgh Pirates. He began the 1979 season in the bullpen, and was 4–2 with a 3.23 ERA with three saves and two blown saves when he was added back to the starting rotation. He responded with four consecutive complete game victories in which he gave up just one earned run per game. He was named to his second National League All-Star team, and pitched two innings while giving up two runs (one earned). On August 14, he pitched a four-hit complete game against the Montreal Expos while hitting an inside-the-park home run to account for both of the Astros' runs in a 2-1 win. He went 3–8 in 1980 splitting time between starts and relief appearances. The Astros won a one-game playoff against the Los Angeles Dodgers to send Andújar to his first postseason. He recorded a save in Game Two of the 1980 National League Championship Series against the Philadelphia Phillies. After starting the 1981 season 2–3 with a 4.94 ERA, he was dealt to the St. Louis Cardinals for Tony Scott just before the players' strike. Andújar returned to a starting role with the Cardinals and responded by going 6–1 for the rest of the 1981 season. In 1982, he pitched a career high ​265 2⁄3 innings. He won his last seven decisions, and had a 1.64 ERA down the stretch to finish the season at 15–10. He pitched a three-hit shutout of the Philadelphia Phillies at Veterans Stadium on September 15 that put his team ​1 1⁄2 games up on the Phillies in the National League East, a lead they held for the remainder of the season. The Cards swept the Atlanta Braves in the 1982 National League Championship Series, with Andújar starting and winning Game Three. He started two games in the 1982 World Series against the Milwaukee Brewers, winning both with a 1.35 ERA. He was taken off the field during Game Three after he was hit in the leg by a line drive. St. Louis manager Whitey Herzog later said that he thought Andújar had been killed by the batted ball, but Andújar recovered in time to start the seventh game. Andújar had a career year in 1984. He was 13–6 with a 2.90 ERA at the All-Star break to earn his third All-Star selection, but was unable to attend. He ended the season at 20–14 with a 3.34 ERA, leading the league in wins, innings pitched (261.1) and shutouts (4) while winning the Gold Glove Award at his position. In 1982 and 1984, he led the Cardinals in wins, ERA, games started, complete games, innings pitched, shutouts, and strikeouts. Andújar got off to a 12–1 start in 1985, and made his fourth All-Star team. The Cardinals and New York Mets became embroiled in a heated battle for the NL East crown that came down to the wire. Andújar went 3–1 with a 4.29 ERA against the Mets that season. Perhaps the most memorable game Andújar pitched in the rivalry that developed between the two clubs was a 5–2 loss on October 2 against Dwight Gooden that allowed the Mets to pull within a game of the Cardinals. The Cardinals won the following day, and ended up taking the division by three games over the Mets. Andújar ended the season at 21–12 with a 3.40 ERA. In the 1985 National League Championship Series, He was ineffective in his Game Two start against the Los Angeles Dodgers, putting the Cards in a two-game hole. St. Louis came back to win the following four games (with Andújar starting the decisive Game Six, but not figuring in the decision) to head to the World Series. Between 1982 and 1985, Andújar averaged over 36 games started per season. A major league pitcher has not had more than 36 starts for one season since Greg Maddux started 37 games in 1991. The World Series against the Kansas City Royals went poorly for Andújar. He lasted four plus innings in Game Three, and took the loss opposite a dominant Bret Saberhagen. John Tudor, meanwhile, was 3–1 with a 1.59 ERA that post-season, leading Cardinals manager Whitey Herzog to go with Tudor in the decisive Game Seven despite the fact that Andújar was on five days rest. The strategy failed, as Tudor was pulled in the third with the bases loaded and three runs already on the board. The score was 10–0 by the time Herzog brought Andújar in for mop-up duty. When umpire Don Denkinger called a ball, Andújar emphatically showed his disagreement, and had to be restrained by teammates. Herzog exploded and was ejected. A pitch later, Andújar was ejected by Denkinger (who misread a gesture by Andújar to catcher Darrell Porter) and again had to be held back by his teammates. Herzog's decision to send in Andújar, normally a starter, led to speculation that it was payback for Denkinger's infamous call in Game Six. Before getting ejected by Denkinger in the seventh game, Herzog said to him, "We wouldn't even be here if you hadn't missed the f***ing call last night!" However, Herzog has often stated that Andújar was the only Cardinal pitcher that still had any life left in his arm; the Cardinals went through seven pitchers in that game. Andújar was so furious after being ejected from Game Seven that he took a baseball bat and demolished a toilet and sink in the visitor's clubhouse bathroom in Kansas City's Royals Stadium. As a result of this, Andújar was fined $500--the maximum permissible amount at the time--and suspended for the first 10 games of the following regular season. He was also ordered to make restitution for the toilet and sink. During that winter's meetings, the Cardinals dealt Andújar to the Oakland Athletics for Tim Conroy and Mike Heath. He was to begin the 1986 season serving a ten-game suspension (later reduced to five) for the World Series altercation with Denkinger. On top of that, on February 28, 1986, Baseball Commissioner Peter Ueberroth handed down season-long suspensions to Andújar, who had also dealt drugs to then-Cardinals teammate Lonnie Smith in 1982, and six other players who had admitted to cocaine abuse during the Pittsburgh drug trials. The suspensions were reduced to anti-drug donations and community service. As luck would have it, Denkinger was the home plate umpire for Andújar's first start of 1986. It was uneventful, as Andújar lasted just four plus innings while giving up six earned runs. Despite his start to the season, Andújar had a decent year in 1986, going 12–7 with a 3.82 ERA. He suffered numerous injuries along the way, including an injury sustained during batting practice even though pitchers do not bat in the American League. Injuries limited Andújar to 13 starts in 1987. The last start was on August 3, and he lasted just two-thirds of an inning, giving up three runs. Andújar returned to the Astros to be part of their bullpen for 1988, but he made some starts in the middle of the season due to injuries in the starting rotation. He ended the season at 2–5 with a 4.00 ERA. He earned a 5-0 record in the Senior Professional Baseball Association (SPBA) in late 1989. When he was signed by the Montreal Expos on December 11, he became the first SPBA player to sign with an MLB club. He was released by the Expos the following March. After retiring from baseball, Andújar started a trucking business in the Dominican Republic. In 2012, Andújar gained induction into the Caribbean Baseball Hall of Fame. He died at his home on September 8, 2015 in San Pedro de Macorís, from complications of diabetes. ^ "Cincinnati Reds 11, Houston Astros 5". Baseball-Reference.com. April 8, 1976. ^ "Houston Astros 1, Montreal Expos 0". Baseball-Reference.com. July 11, 1976. ^ "Houston Astros 1, New York Mets 0". Baseball-Reference.com. July 17, 1976. ^ "1977 All-Star Game Play by Play". Baseball Almanac. July 19, 1977. ^ "Houston Astros 7, Pittsburgh Pirates 5". Baseball-Reference.com. August 25, 1978. ^ "1979 Major League Baseball All-Star Game". Baseball-Reference.com. July 17, 1979. ^ "Houston Astros 2, Montreal Expos 1". Baseball-Reference.com. August 14, 1979. ^ "1980 National League Championship Series, Game Two". Baseball-Reference.com. October 8, 1980. ^ "St. Louis Cardinals 8, Philadelphia Phillies 0". Baseball-Reference.com. September 15, 1982. ^ "1982 National League Championship Series, Game Three". Baseball-Reference.com. October 10, 1982. ^ a b Schudel, Matt (September 9, 2015). "Joaquin Andujar, colorful pitcher for the St. Louis Cardinals, dies at 62". Washington Post. Retrieved October 15, 2015. ^ Jim Tommey and Kip Ingle, ed. (1987). St. Louis Cardinals 1987 Media Guide. St. Louis National Baseball Club. p. 143. ^ "New York Mets 5, St. Louis Cardinals 2". Baseball-Reference.com. October 2, 1985. ^ "1985 National League Championship Series, Game Two". Baseball-Reference.com. October 10, 1985. ^ "1985 National League Championship Series, Game Six". Baseball-Reference.com. October 16, 1985. ^ a b c "Joaquin Andujar Statistics and History". Baseball-Reference.com. ^ "Progressive Leaders & Records for Games Started". Baseball-Reference.com. ^ "1985 World Series, Game Three". Baseball-Reference.com. October 22, 1985. ^ "1985 World Series, Game Seven". Baseball-Reference.com. October 27, 1985. ^ "Falling Cards". Time. November 11, 1985. ^ "Players Penalized for Drug Ties". Pittsburgh Post-Gazette. March 1, 1986. ^ "California Angels 9, Oakland A's 3". Baseball-Reference.com. April 12, 1986. ^ "Seattle Mariners 4, Oakland A's 3". Baseball-Reference.com. August 3, 1987. ^ a b Giuliotti, Ed (January 28, 1990). "Andujar can still pitch, and has tamed his temper". Sun-Sentinel. Retrieved October 15, 2015. This page was last edited on 28 February 2019, at 22:03 (UTC).